Our tour of this dream beach house designed by Lindsey Cheek of Gathered continues! (Go here if you missed the living and dining room.) There’s no denying the Wilmington, North Carolina-based interior designer was inspired by the Figure Eight Island home’s stunning water views. 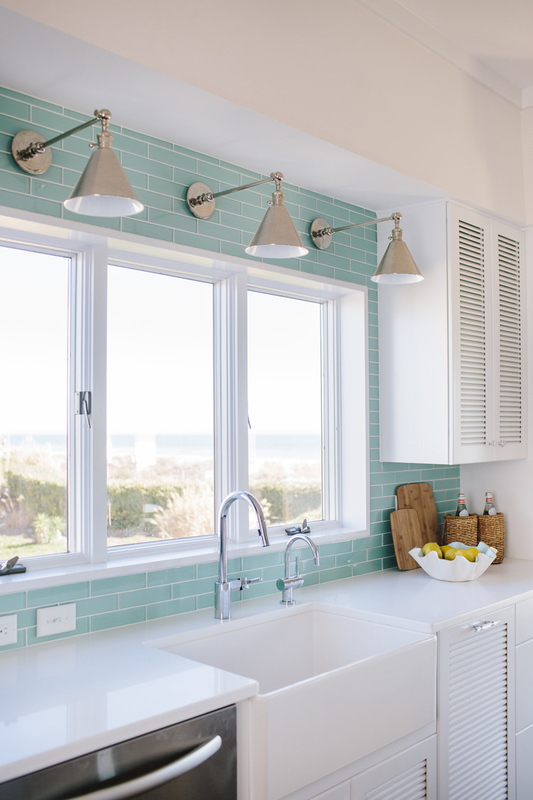 The crisp, bright gourmet kitchen makes the most of the beach view while splashes of turquoise perfectly complement it. The addition of natural texture only adds to the coastal vibe! What’s most inspiring to me is that the designer kept the same cabinets, same appliances, same layout?yet a fresh coat of paint and major updates on finishes and lighting completely transformed the space (see the before pics at the end)! Scroll on for more great images by Mille Holloman and Amanda Holloman! Love the gleaming subway tile?2 x 8 Glass Ice Mint with Avalanche grout. A fab pairing with the Caesarstone in Pure White.